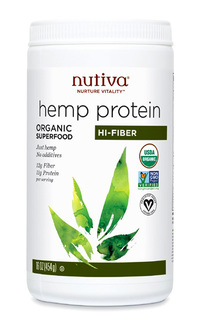 Organic Hemp Protein Hi-Fiber, 16 oz / 454g (Nutiva) - Penn Herb Co. Ltd.
Get powerful plant nutrition with Nutiva's Organic Hemp Hi-Fiber Protein. One serving of this superfood provides 11 grams of raw organic protein and 12 grams of fiber per serving. Hemp contains all 9 essential amino acids, with the bonus of good-for-you essential fatty acids (2g per serving). Why Hemp Protein is Ideal? Of the protein, 66% is edestin (a bioactive globulin protein that's easy to digest) - more than any other plant! 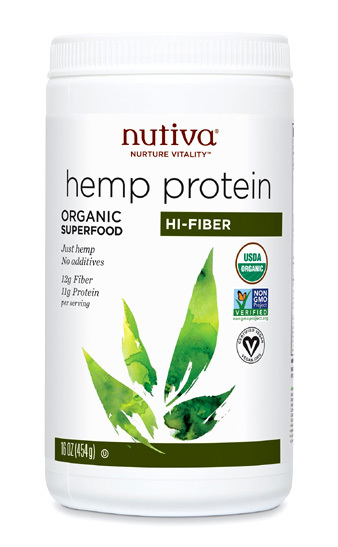 Nutiva Organic Hemp Protein contains high-quality plant protein with the branched-chain amino acids that are vital to good health, and it's super easy to digest. The protein found in hemp seed is very digestible, making it a great choice for sensitive diets. Organic Hemp Protein made without hexane, dairy, lactose or sweeteners. Vegan. Non-GMO. Non-BPA. Made from raw hemp seed. No additives. Blend 2-5 tbsp Hemp Protein with 8 oz milk (almond milk is ideal) and a ripe banana. Keep container cool. Refrigerate after opening.